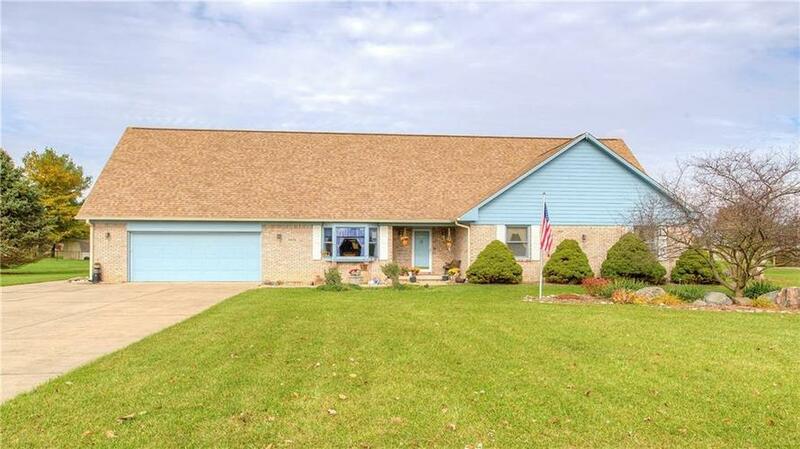 The perfect home in highly desirable New Palestine. This 2300 Sq Ft, 4 bedroom, 3.5 bath home has vaulted ceilings in the great room. The master suite is large with a double vanity in the master bath Upstairs features a full Bedroom, Full Bath and 2 bonus rooms that could be in-law/guest quarters. New roof in 2016. The home has fresh paint, large bedrooms and closets, real wood trim, 400 amp service and solid core interior doors. The garage is massive with a space for a workshop or two. The .61 acre corner lot offers a ton of space and the back yard is enclosed by a 6' chain link fence and sports a two-story barn. Plenty of space from neighbors. DO NOT MISS THIS ONE! Directions:From US 52 Turn north on 600 W (MT COMFORT RD.). Then, TURN left onto ELAND.